Why Won't Lawbreakers Come To The Nintendo Switch? The lead designer's given answer is both puzzling and hilarious. Players who like to stay on top of the latest first-person shooter titles have likely heard of or even played an early version of Lawbreakers, the upcoming title from industry veteran Cliff Bleszinski's new studio Boss Key Productions. It's a fast-paced and vertically-focused shooter that aims to push the limits of action and visual fidelity, which initially lead many gamers to believe that it would never release for a system as moderately-powered as the Nintendo Switch. 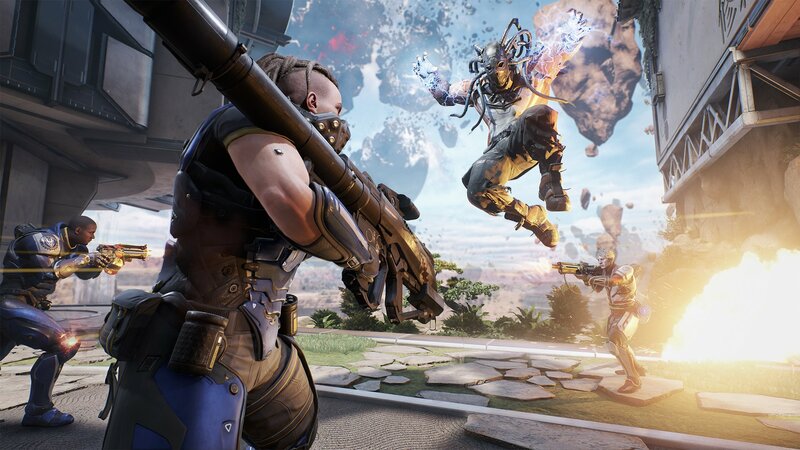 As it turns out, however, a lack of available processing power doesn't appear to be the reason why Lawbreakers isn't coming to the Nintendo Switch. Instead, Lawbreakers lead designer Dan Nanni said the primary concern for releasing the game on Switch was the hybrid console's alleged lack of buttons. Seeing as how the game has a planned release for PlayStation 4, players unsurprisingly started tallying up total input options and comparing the numbers between the two consoles. And, unfortunately for Nanni, the results don't add up. "It Doesn't Have As Many Buttons"
Doesn't The Switch Have Just As Many Buttons As The Dual Shock 4? That's correct. Both the Nintendo Switch and the PlayStation 4 have input configurations with two analog sticks, one directional pad, four primary face buttons, two system buttons, a Home button, two bumpers, two triggers, and a central touch-capable area. Naturally, this doesn't account for playing games with only one Joy-Con, but players haven't been used to playing shooter titles with a single joystick since the Nintendo 64 days. It's basically a given that any 3D-enabled title would require the use of both Joy-Con controllers -- or perhaps even the Nintendo Switch Pro Controller. Also worth mentioning is that the Switch's Joy-Con controllers have two additional shoulder buttons tucked under their mounting rails, meaning players who are using only one Joy-Con to play a game are only two shoulder buttons and one analog stick away from having a full controller-like experience. And Yet Lawbreakers Could Come To The Xbox One? If this quote from Nanni is to be believed, the Lawbreakers team could possibly bring the title to the Xbox One -- the given quote was that Boss Key Productions could "probably make it work" given the Xbox One's controller. Of course, in contrast to the stated reasoning above, the Xbox One does actually have fewer buttons than the Switch or PlayStation 4 controllers, since it lacks the aforementioned systems' central touch-capable areas. With touch-enabled or "soft" buttons removed from the scenario, all three consoles have essentially the same number of buttons on their controllers. Could The Nintendo Switch Could Run Lawbreakers Otherwise? Given the hogwash about a lack of buttons being the reason that Lawbreakers won't be coming to the Nintendo Switch, one could reasonably assume that the Switch could otherwise run Lawbreakers just fine. It might not run at the same resolution or even the same framerate as it would on other platforms, but if a perceived lack of buttons is the biggest hurdle the developers have had to consider, we can only assume that processing power and performance are non-issues. However, there's one problem with that assumption: it's based around a quote that shows a shocking amount of ignorance regarding the Switch's basic hardware. If Nanni couldn't accurately count a number of buttons, it's safe to say that we shouldn't rely on his opinion on whether or not a game could run on any given system. Even though the Switch doesn't have very many buttons, players should still be able to enjoy some of the system's most popular titles, such as the ones we've featured on our list of the Best Nintendo Switch Games.